On December 18, 2017 A Vision in Motion speaker Dan Occhiogrosso will be speaking to all of the Winter student-athletes at Passaic County Technical Institute High School in Wayne, NJ. from 8:30-9:30am. PCTI Athletic Director Nic Nese has invited Dan back for his second visit in three years to present “Create The Crossover.” Dan’s program stresses a substance free message and promotes self-esteem and confidence building. 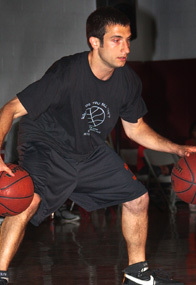 He relates to students how he took a simple challenge in the seventh grade from a successful college basketball coach that changed his life forever: practice your dribbling for five minutes a day. Accepting that challenge not only helped him become an incredible ball-handler, it also led him see that he could play basketball for something bigger than himself. After playing four years of high school basketball in New Jersey, “Occh” went off to play four years of college basketball at Baptist Bible College in Clarks Summit, PA. Through both great success and failure he simply continued to dream about using basketball to accomplish something big in the world. Dan has raised funds for South African orphans by dribbling his basketball through the entire New York City Marathon. He has organized service trips to other countries helping those less fortunate and serves as a role model for young people who may want to give back to their community. “Dan Occhiogrosso visited Corning-Painted Post High School and spoke to our students using the message “Live for Something Bigger Than Yourself”. His “Create the Crossover” speech captivated and motivated our students. To get and maintain the focus of approximately one thousand students for an approximately one hour presentation was impressive! To have our students continue to speak about him and his message has been invaluable to our school community! The feedback we received from students makes me highly recommend Dan Occhiogrosso to any high school that is focused on bringing students motivating speakers regarding building character, making choices, and respecting themselves and others.